If you’re familiar with the concept of slow money you know it’s a new way of thinking about investing money sustainably with a focus on food and agriculture. It’s been dubbed one of finance’s biggest recent trends and next week the movement gathers supporters in San Francisco for its 3rd Annual Gathering. The Slow Money Alliance is hosting its third national gathering in San Francisco next week. It’s an event that will bring together investors, entrepreneurs, farmers, and thought leaders, all with the common interest in changing the world through food and agriculture. The Gathering takes place over three days, October 12th to 14th, and registration is still available. A highlight of the Slow Money Gathering every year is the Entrepreneur Showcase. Innovative food enterprises are given the opportunity to present their ideas and stories with investors and thought leaders as an example of the innovation happening in the space. Since the previous Gathering in 2010, more than $4.25 million has been directly invested in a dozen of the presenting small food enterprises. Foodtree is among the thirty selected organizations taking part in the showcase, so keep an eye out for our CEO, Anthony Nicalo as he pitches on Thursday. If you’d like to connect with Foodtree during Slow Money, Anthony will be in attendance for the entire event. He’ll also be participating in a breakout session discussing Mapping Food Sheds on Wednesday at 1:30pm. Stop in and say hello! Tomorrow evening Anthony will be one of nine people telling a personal story on the theme of “Recipe For…” at Rain City Chronicles. If you’re unfamiliar with this event the best way to describe it is live storytelling by every day people sharing personal stories. I’ve attended two in the last six months and have really enjoyed the experience. It’s a bit like listening to live versions of podcasts “This American Life“, or “The Moth“. The full line up for the evening finds Anthony in excellent storytelling company: Eagraine Yuh, Warren Bates, Mark Busse, Ross Milne, Anastasia Koutalianos, Janet Feirin, Tyler Lepore, and Annika Reinhardt. The show is Wednesday, May 11 at the Firehall Arts Centre in Vancouver, and I’ve heard tickets are almost sold out. You can buy them online through the Firehall Arts Centre Box Office. Fun notes on today’s release! As Foodtree evolves we keep pushing towards a day in which our comprehensive food database serves citizens what they’re hoping to know about their food, everywhere they want it delivered to them. The database we’re building isn’t a matter of organizing a bunch of spreadsheets. It’s a database you have the opportunity to participate in, because our food system is a human one, and it’s constantly changing. Made by humans, moved by humans, and consumed by humans our food system is a social being, and so should be the database that enhances it. Contributing to the Foodtree Community got a little easier today, as we release an update that simplifies the site a bit, gives you a better navigation bar and reminds you that if you’re searching for a food business near you, and you don’t find it, you can quickly add it to the community. You can become a fan of your favorite producers and you can request that they stop by to share their story with us…things like where you can buy their products* and who the people behind their products are. *Food businesses can also now put a Foodtree Where To Buy Map widget on their own websites, keeping this information up-to-date easily and in both places without any technical knowledge. We’ll even help them install it! For both members and food businesses, we’re now measuring your Reach, which is the number of food sources your profile is connected to. All of these measures will be used to give our community various benefits like awards, badges, coupons, and exclusive features. Start contributing now to get a head start! We released contribution stats a while ago, and they’re becoming more important. We want to make it worth everyone’s while to contribute to Foodtree. We’re now measuring a handful of stats related to contribution and participation. 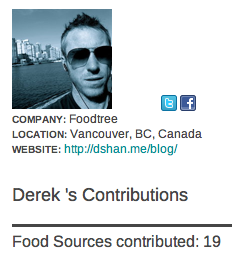 We’re tracking everything you add to Foodtree, everything you Fan, and everything you add to Personal Foodtrees. We hope you like the update, and let us know how we can continue to make it a great place to contribute your knowledge about what you’re eating, and you relationship to your food system. Got thoughts or questions? You can always find us on Twitter, or shoot an email to community@foodtree.com.